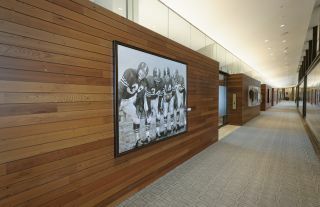 Reclaimed redwood from Hangar One at NASA's Ames Research Center in Moffett Field, California lines the halls of Levi's Stadium in Santa Clara, home of Super Bowl 50. Hey, football fans! As you gear up for today's Super Bowl 50, you might be surprised how much space is involved – and we're not just talking about the satellite television feed that will beam the big game into your living room in glorious high-definition. Aside from the astronauts watching Super Bowl 50 from orbit on the International Space Station, there's a bit of space history and technology working behind the scenes for today's game. From to GPS devices that track football players, the final frontier has a key part to play when the Carolina Panthers face off against the Denver Broncos at Levi's Stadium in Santa Clara, Calif.
Reclaimed redwood from Hangar One at NASA's Ames Research Center is seen near the stripped down airship hangar at Moffett Field in California. The wood came from Hangar One, a famous area at San Francisco's Moffett Field -- a hotspot for Navy, Air Force and NASA activity for activities related to World War I, the Cold War of the 1960s, and civil aerospace activities afterwards. The U.S. Navy gave Moffett to NASA's Ames Research Center in 1994. Costs of preserving the facility proved prohibitive for NASA. So in 2012, workers stripped the iconic wood paneling from the hangar, leaving a bare metal skeleton that stands today. The 49ers owner's wife, Denise DeBartolo York, subsequently asked for the wood to be used at Levi's Stadium. The wood was installed after sanding and taking off the top layer (to remove decades of paint and dust) and plugging holes. An artist's illustration of the next-generation GPS III global positioning system satellite in orbit. During today's game, GPS devices will watch the locations of team members and officials. This process will start while the teams are commuting to the stadium, just in case somebody gets stuck in traffic on the way. NFL teams generally also use GPS technologies to keep track of player stats such as heart race, step balance, impact forces with opponents and stress loads. Fans can also get free turn-by-turn GPS navigation to the game using the "Road to 50" app. After the game, that same app can point you to local Super Bowl celebrations. "Football fans heading to Northern California this week will have no other choice but to rely on GPS to get them around Super Bowl 50 venues, the most spread out in history," officials with the U.S. Air Force Space Command wrote in a statement. Student intern Joe Burces at NASA's Ames Research Center observes a football in fluid dynamics chamber. NASA also has run some football aerodynamics tests to determine what can make the perfect spiral. Scientists at the agency's Ames Research Laboratory have used a fluid dynamics test chamber to study how objects fly through the air. "When a quarterback throws the football, he ideally wants to throw a tight spiral with high rotation rate to help stabilize the ball as it flies through the air," Rabi Mehta, chief of the Experimental Aero-Physics Branch at Ames, said in a statement. "This produces lower drag than a wobbling ball, so it will get there faster." British astronaut Tim Peake of the European Space Agency poses with a broadcast of a 2016 Six Nations Championship rugby match on the International Space Station on Saturday, Feb. 6. Millions of people are able to watch Super Bowl 50 today from the ground thanks to communications satellite technology, but there are also six potential fans sitting on board the International Space Station. To serve the astronauts there, NASA will have a live broadcast of the game so that the Expedition 46 crew can follow it play-by-play. In fact, Super Bowl 50 is not even the only major sports event the space station crew is following this weekend. British astronaut Time Peake of the European Space Agency has been actively following the 2016 Six Nations Championship of rugby between England, Franc, Ireland, Italy, Scotland and Wales. He has been enjoying the rugby matches courtesy of BBC broadcasts beamed to the space station especially for him. "It’s a win-win for my sons today (half Scottish, half English) but as far as I’m concerned…COME ON ENGLAND!!" Peake wrote on Twitter Saturday (Feb. 6) ahead of the rugby match between Scotland and England. (England won 15-9).